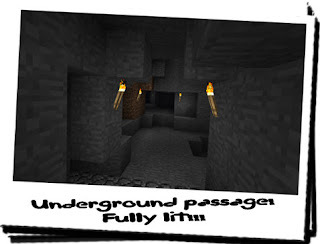 Diary of a Miner: Day 31: One month later, and more mysteries than you can shake a stick at! Day 31: One month later, and more mysteries than you can shake a stick at! I fear that my comment of "having an adventure" yesterday may have jinxed me! I thought today would be a 'normal' day, but something decided to get in the way of those plans, and set me down a slippery slope of mystery, fear and intrigue! I headed down to the mine, as the sun rose from the horizon in the East. It was a very beautiful sight to see the giant orb of light climb over the edge of my wall, and i had to just stand there and admire it for awhile! It was an ingenious solution to my problem of security, and yet it retained the aesthetical beauty of a statue! Getting my mind back into gear, I continued towards the mine... I had already achieved quite a depth yesterday, and with a brand new day ahead, I hoped to gather loads more ore! As if those words had granted a wish, within the first hour I had located masses of coal and iron! Once again, I went back and forth to the half-way point with my "loot" and left it in the chests. I would smelt it at a later time of the day so I could concentrate on mining! I may have mined a good portion of the ore in this region, because after making a huge killing with iron and coal within the first hour, I saw nothing but stone and dirt for the next three! By about 10:00am I decided to take a break, and decided to have a stroll around the wall, more specifically the wall facing the cliff! I went towards the forge and went up to the rooftop access. I had cleverly built the wall close enough to the forge to be able to get onto it from the rooftop access! A short 30 second walk took me to the edge of the wall facing the cliff, but I could see nothing unusual. That is, I could see nothing at all! Satisfied with the lack of anything suspicious, I returned to where I had left off. It wasn't long though before i could hear running water! I could see above me that I was far too deep below the surface for it to be on top, so I assumed it had to be a spring or pool! After a bit more mining, the wall sprung a leak and water gushed forth, tearing the wall apart under the pressure! After enough of the water had leaked out, I noticed the water had made a big enough hole to be able to walk through! Then something else caught my eye: light! There was light coming from inside where the water was! Once again, I was too low for the light from the sun to be the cause. That left either lava or fire! Both were rather dangerous, especially if there were small pockets of toxic or flammable gas! I waded through the stream of water and into the cavern! The pathway was fully illuminated... but not by lava, and not by fire... by torches!!! There were numerous torches lining both walls of - what I now realised was a tunnel! Cautiously, I made my way down the tunnel, keeping close attention on any shadows and listening for any noises. Foolishly I had left my weapons at home (not that this was what I expected to find whilst mining) and so I brandished my shovel instead! I then reached a juntion in the tunnels; one went straight on, the other veered off to the right. However, the tunnel to the right was not illuminated, and with me possessing no torches, I decided to pick the tunnel straight ahead. This tunnel wnt on for some distance, all the while, torches lined the walls at regular intervals. After a few minutes of walking, i came to a sort of T-junction that split off to the left and right. Both were fully lit as far as i could see down them. I was going to choose the left tunnel, until I heard a strang rasping noise down the right one! I don't know why, but my adventurer side seemed to kick in, because before I knew it, my legs were taking me down the right-side tunnel towards the sound! As I got closer, so too did the noise, however it changed from a rasp to a low hiss! 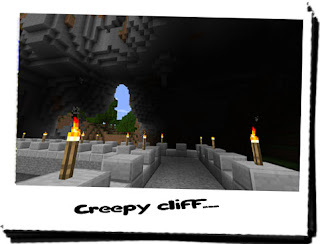 Remembering the Creeper in the trap, I would recognise that sound anywhere, but it soon stopped, and the only sound that could be heard was the running water back up the passage! I crept forward, trying to keep quiet, which is not easy on stone! A little way along I noticed a slight hint of green to some of the stone, and realised that it was moss! More moss? Was this the same stone as the stuff found on the surface close to the forge? I then noticed that a greater degree of light was spilling out from a corner close to the right side, and I edged around until I saw the source of the light. When I did, I nearly fainted! I edged closer into the strange room, shovel clutched to my chest when I heard a shuffle to my left. In the corner, was a zombie! Almost identical to the one that attacked me weeks ago, but with different clothing! It saw me and began lumbering clumsily towards me, groaning. The "fight or flight" instinct kicked in, and before I knew it, I was beating the zombie senseless with the shovel! I had managed to smash it to the ground, and was repeatedly whacking it forcefully on the head! Only after the twitching stopped did I too cease my aggression! I stumbled away and watched in disbelief as the remains turned black and crumbled to dust! I stood there, leaning against my shovel, breathing heavily. Wiping the sweat from my forehead, I looked around the room and noticed the same objects that had been in the first chamber I had found; two chests and a strange cage with a small person inside! Curious, I bent down and stared into the cage, only to noticed it was a small zombie, spinning like a top in the centre of the cage... on fire! What was this thing?!?! Where did the zombie come from?!?! So many questions buzzed around my head it hurt! After awhile of taking it all in, I decided to look in the chests, like I did last time. The first one i checked was entirely empty! The second however ontained huge quantities of the strange blue stones I had found - lapis lazuli! Remembering that HoN Co. had translated from the book that it was used in the sorcerous experiment, I took it all out and placed them into pounchs in my bag! Turning my attention to the strange cage, I decided that this time I wasn't going to leave it. It was obviously dangerous, and I couldn't just leave it here. Although I had a number of choices; I could smash it to pieces, blow it up with TNT or bury it! The last option seemed a stupid idea because it could easily be unearthed, and the TNT was out because there was none left. That left the former option... After getting my breath back, I raised my shovel and smashed it into the cage! It buckled slightly, so I repeated this action three more times. The cage had begun to fall apart, and the fire was starting to look very meek! Five whacks of the shovel later, and the cage was nothing more than a flattened sheet of iron strips! The fire had gone out, and the strange zombie in the centre had vanished from sight. With that, I ran back to the surface! When I got out, it had started to rain; it felt good on my face. I couldn't believe what had just happened! What were those strange cages? I had found two of them now, accompanied by chests in a strange mossy-walled chamber! I returned to the half-way point, remembering the ore I had dug up earlier and took it to the forge. I spent an hour refining the ore into ingots and then left them there! It wasn't like anyone was likely to take them, but I secured the door just in case! Returning to the house, I searched straight away for the translation that HoN Co. had given me of the book. I wanted to know what part this lapis lazuli played in this experiment! I was going to get to the bottom of this! 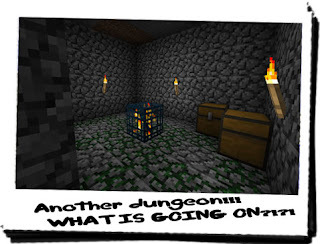 I needed to know what was going on... for the adventurer's side of me!